The Hallyu, shopping and tourism combined Korea Grand Sale is going to be hosted for a month, from the 1st of October to the 31st of October all around Korea. This festival offers a variety of benefits and offers for foreigners from shopping, flight/transportation, accommodations, beauty/health, food and beverage, show performance, culture, tourist attractions and more. A number of various festivals and cultural events such as K-POP concert, are also not to be missed. This year, under the big title of ‘Korea Sale FESTA’, there lies ‘Korea Grand Sale (10.1~31)’ for foreigners, and a mega shopping discount festival ‘Hot Sale Week (9.29~10.9)’ being organized together, as well as ‘K-Culture Fair (10.1~31)’ introducing diverse Hallyu culture festivals from all-around regions in Korea. Through such systematic integration, we are expecting a synergy effect for the potential to develop the festival into a premium international Hallyu, shopping and tourism combined festival, all adding up towards making the image of Korea as an attractive shopping destination. Especially since 2011, Korea Grand Sale for foreigners was promoted to attract foreign tourists to Korea in order to overcome low-season in tourism. Starting from this year, the hosting period is confirmed to take place during October and February every year, to get rid of the confusion between the participating companies and foreigners. Analyzing the past 5 years of Korea Grand Sale, the outcome was over 1.1 trillion won in production inducement and employment effect of 15,000 people. Also, the number of foreign visitors to Korea during every January~February, have increased averagely by 15%, the amount of consumer spending by 12% in the years from 2011 to 2015 when Korea Grand Sale was being held. Sales from foreigners have also improved from the participating organizations, adding up to total of 650 billion won during the five years, and the sales amount by foreigners during the second half of last year have increased about 29 times compared to the first year’s sales amount from foreigners. The number of participating stores have also increased to approximately 35,000, about 2.5 times growth compared to the first year’s 14,000 stores. First, during October when the Korea Grand Sale is being held, various benefits like 1+1 events, discount and free gifts are available from shopping, flight/transportation, accommodations, beauty/health, show performance, tourist attractions, food and beverage and other areas. For instance, Asiana Airlines provide 1+1 event for 2 or more people booking flight tickets on 24 routes in China, 10 routes in Japan, and up to 60% discount on flight tickets to South East Asia and Europe routes. Hyundai I’ Park mall provides up to 50% discount, Shinsegae Department Store also provides up to 30% discount, and Lotte Duty Free offers various discount benefits by the amount of purchase. Innisfree offers 20% discount when paying by foreign credit cards, Grand Hilton Seoul offers 50% discount when staying for 2 nights or more in deluxe rooms. K-live offers 50% discount on tickets for hologram concerts of K-POP stars. Last but not least, up to 50% discount is available on K-Travel Bus, a 1 night 2 days bus tour package that travels around the popular regional tourist attractions of Korea at reasonable prices during the Korea Grand Sale period. Secondly, there will be a number of experience and participation events for the foreign tourists visiting Korea. Starting from the K-POP opening ceremony concert on the 30th of September (Fri.) at Yeongdongdaero in Gangnam, two more Hallyu concerts will be held on the 14th of October(Fri.) and the 15th of October(Sat.) at the square in front of Yongsan station in Yongsan-gu and COEX in Gangnam-gu respectively. Furthermore, there will be an opportunity for Hallyu fans to enjoy a shopping tourism date with a Hallyu star. On the 1st of October (Sat. ), a welcoming event will take place at Incheon International Airport and Gimpo International Airport for tourists visiting Korea. In addition, various experience events will be available from the participating companies during the Special Theme Week, consisting of Must-Buy Week (10.1~9), Must-See Week (10.10~16), Must-Do Week (10.17~23) and Must-Eat Week (10.24~31). Free gift events for foreigners visiting the Korea Grand Sale event center will also be available separately, where participation can be made with purchase receipts of total amount over 100,000 won from any participating stores and/or organizations. Thirdly, we recommend cultural festivals and tour courses where you can build wonderful memories. The Korea Grand Sale’s homepage provides information about various Hallyu cultural festivals and related tour courses across the country in different languages. Some of many festivals include Busan One Asia Festival (10.1~23), Gwangju Biennale (9.2~11.6), Jarasum International Jazz Festival (10.1~3), Korea Drama Festival (10.1~6) and more. Moreover, by cooperating with airlines and travel agencies, tour package development and promotion marketing for foreigners will also be conducted actively. Lastly, there will be various convenient services available for foreign tourists. Such services as interpretation service (Chinese, English and Japanese), festival information, free Internet/WiFi service and free gifts and more will be offered from the event center at Doota Square in Dongdaemun during the entire festival period. Foreign language interpretation and tourism information service will also be available from the Tourist Service Center, a remodelled 3.5 ton truck, which will travel across Myeongdong, Hongdae, Yongsan, Gangnam and other regions. Up to 50% discount will be offered on Hands Free Service, a luggage delivery and storage service at department stores, hotels, airports and other major sites in Seoul. In addition, K-Tour Card which adds convenience in transportation and benefits in tourism, will be released from late September, and promotional activities for foreign tourists and transferring tourists will be implemented. More information about Korea Grand Sale is available in Chinese, English and Japanese from the Korea Grand Sale’s homepage, and continuous festival updates and information are being uploaded through various SNS channels including Facebook, Weibo, Instagram and Line. Overseas promotional marketing is also being conducted actively. Promotional materials such as promotional Hallyu star videos and leaflets are to be spread via overseas networks held by the participating organizations, Visit Korea Committee, and other related organizations. In addition, Korea Grand Sale will be introduced to foreign countries by participating in foreign tourism exhibitions, fairs and expos along with other participating organizations, starting with Singapore ‘Travel Revolution(8.19~21)’, Malaysia ‘MATTA Fair(9.2~4)’, Japan ‘Tourism Expo(9.22~25)’ and ‘Korea Japan Festival(9.24~25)’. In Hong Kong, trams, which are Hong Kong’s representative public transportation, will be used for outdoor advertising with exterior wrapping material for 4 weeks from the 12th of September to the 9th of October. In Korea, banners for the streets and street lights will be used in Korea’s popular tourist attractions. This year’s Korea Grand Sale is being planned out to build the most diverse and enjoyable atmosphere by combining a wide range of benefits in a wide range of areas for the foreign tourists visiting Korea, with Hallyu and a lot of regional culture festivals. 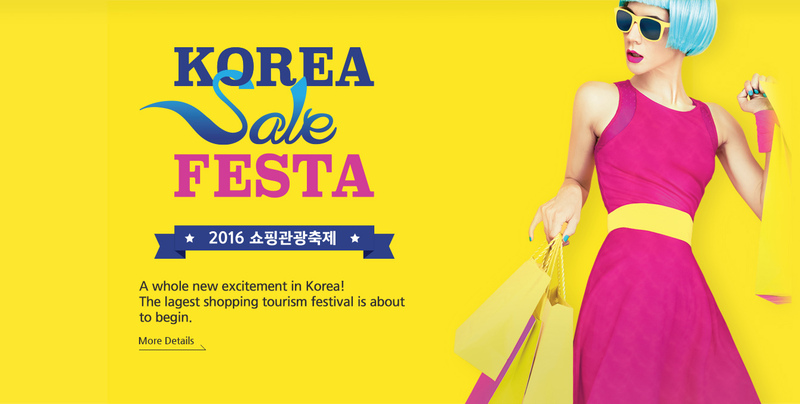 A Shopping Tourism Festival you should never miss in Korea during October, ‘Korea Grand Sale’ is coming soon.